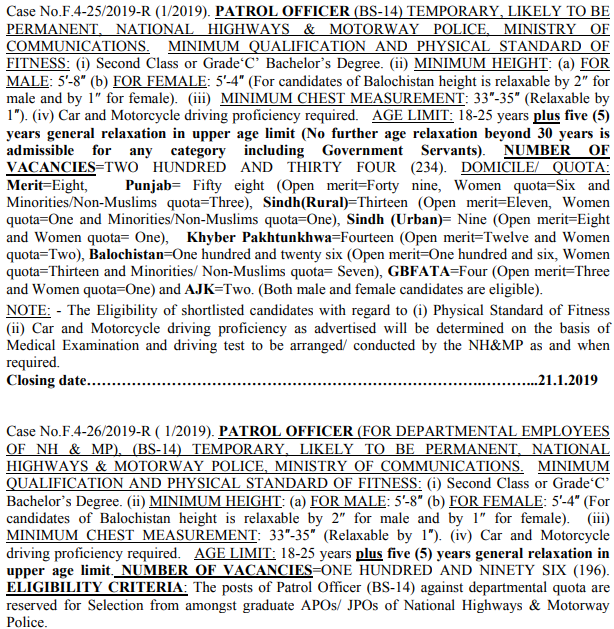 The Federal Public Service Commission has announced excellent jobs in the Motorway Police.Motor police jobs 2019 can apply to people from across Pakistan.More than 430 vacancies have announced jobs by the Federal Public Service Commission in National Highways and Motorway Police.In the duty of the motor police, both boys and girls can apply.I will provide you complete information about the duty of the motor police job 2019 by FPSC.You must have a graduation degree with Second Class or Grade‘C’to apply for the job of a motor police.You can apply online at the National Highway Motorway Police job.You need 18 to 25 years of age to apply for the job of a motor police and plus five (5) years general relaxation in upper age limit. If you have any questions regarding the duty of a motor police, you can do the jobs below the article.If you are coming for the first time on this web site, So subscribe the our website to that you get information about all the jobs in Pakistan. You must have a graduation degree BA,BSc,B.com,BBA,with Second Class or Grade‘C’to apply for the job of a motor police by FPSC. 18 to 25 years age limits & 5 years age relaxation. The National Highway and Motorway Police job can apply both boy and girl. The Federal Public Service Commission announced more than 430 jobs in the Motorway Police. You can apply online jobs in National Highway and Motorway Police click on the link below.